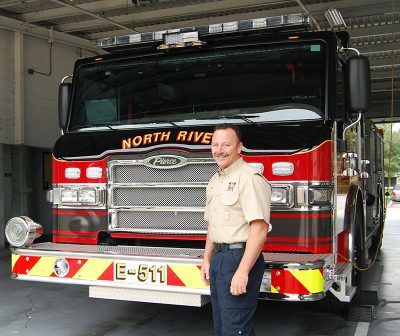 The recent disastrous highrise fire in London where more than 75 people died highlighted the importance of training and planning at the North River Fire District. “All of them are equipped with early detection systems,” said Rampino, who has been chief of the district for three years. The firefighters also have specific training and equipment for fires in tall buildings, he said. One of the special apparatuses needed for highrise fires in the district’s arsenal is a 75-foot aerial or ladder truck. “It reaches about five stories,” the chief said. Also, district trucks and engines are equipped with highrise packs containing hoses and nozzles for the water standpipes located on each floor. But the most valuable tool the department has is trained firefighters, Rampino said. “Firefighters do training pretty much every day,” he said. The safety instructor also organizes special training exercises, such as procedure for a building collapse or water search and rescue. The North River Fire District has 49 firefighters and six administrators and staff. All five of the fire stations within the district are staffed with firefighters 24 hours a day. “Firefighters work 24 (hours) on and 48 off,” said Rampino, who has 31 years in fire service. “This is the industry norm. “A typical day for a firefighter at the station would be in the morning to check out the equipment and apparatus,” he said. Then they do building maintenance. Engineer Luke Kushto, left, who has nine years with the North River Fire District; Firefighter Blake Hannaford, four years; and Firefighter John Mueller, six years, stand in front of the aerial truck, which has a 75-foot ladder, based at Station 2. The bulk of the calls are for medical reasons, and because there are more than 17 miles of interstate in the district, they also answer a lot of motor-vehicle accident calls, he said. The district also includes a shipping port, a small airport and smaller industrial buildings, along with the residential buildings. One of the more memorable calls the chief recalls in his time with the district was an elemental salt pearls fire at Port Manatee in April. Firefighters worked that incident for more than five hours, according to news reports. All firefighters in Florida have to have completed a certified training course and pass two state examinations — a written and a practical. Manatee Technical College operates the Fire Academy at its East Manatee Campus, 5520 Lakewood Ranch Blvd., where potential firefighter candidates learn what it takes to be in the fire service. Chief Henry Sheffield, coordinator at the academy, said to be a volunteer firefighter a student needs to complete the Firefighter I course, which is 206 hours of instruction. To be a career firefighter, the student would need to complete both Firefighter I and Firefighter II courses, a total of 398 hours. It takes approximately three months to complete the two courses if attending full-time and about seven months if the student is going part-time. Full-time classes are eight hours a day, five days a week, while part-time classes are twice a week in the evening. All Fire Academy applicants need to have completed the EMT course offered at MTC. The college also has a program for high-school seniors, allowing them to complete the Firefighter I course for credit while in high school. “Once they graduate and turn 18 they can start the Firefighter II course the following fall,” Sheffield said. The Fire Academy classes are composed of candidates from all walks of life, he said. Also, every class has at least one female student, the chief noted. “The last class was made up of 31 percent women (five of the 16 graduates),” Sheffield said, “but generally there are at least a couple of women in the class. “The draw is that you can make very good money,” he said. There is a need for firefighters in Florida because many of the larger departments are having a lot of retirements and there are more job openings, said the former chief of the former Braden River Fire Control District, now part of East Manatee Fire Rescue District. A lot of the students come from the emergency medical or paramedic services, so they are familiar with emergency services, said Sheffield, who became coordinator of the academy 2 and one-half years ago, after retiring from more than 40 years of active service and working at the State Fire Marshall’s office in Ocala as a training officer. Once a fire district hires the academy graduates, they will have to deal with a variety of emergency situations. The North River Fire District encompasses 82 square miles and includes the communities of Ellenton, Gillette, Memphis, Palmetto, Palm View, Piney Point, Rubonia, Snead Island and Terra Ceia, according to the district web site. North River was formed in 1988 when the Ellenton Fire Control District and the Palmetto Fire Control District merged. There are five stations throughout the district, and the administrative offices are located at Station 1, 1225 14th Ave. W, Palmetto. The district boundaries are from the Sunshine Skyway Bridge and the Hillsborough County line to the Manatee River, and from the Gulf of Mexico shoreline to around Harrison Ranch area out east. 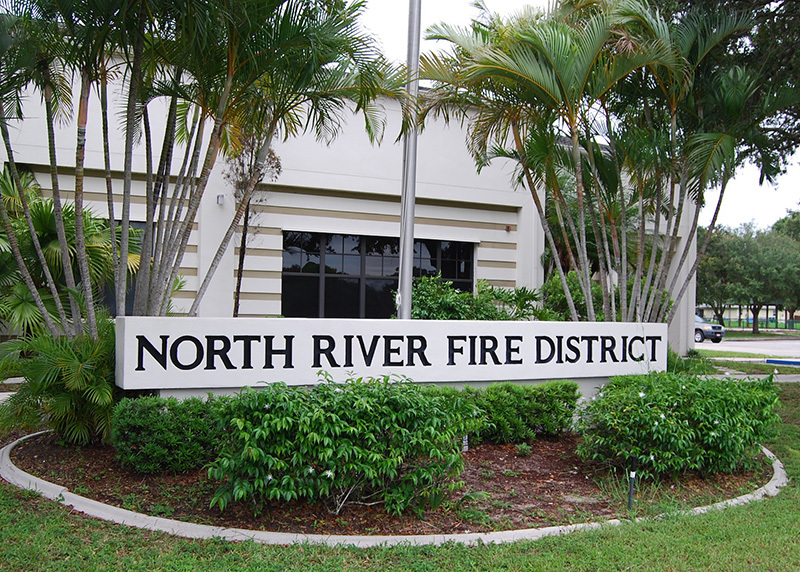 The North River Fire District encompasses 82 square miles from the Sunshine Skyway Bridge and Hillsborough County line to the Manatee River, and from the Gulf of Mexico shoreline to around the Harrison Ranch area out east. An elected seven-member commission overseas the $7.2 million annual budget. The commissioners, serving a four-year term, are Paul J. Pitcher, chairman; Robert M. Bell, vice chairman; Scott R. Smith, treasurer; Michael P. Browning, secretary; Harry L. Blenker; and James D. Alderman. This year’s district assessment for fire protection is about $170. 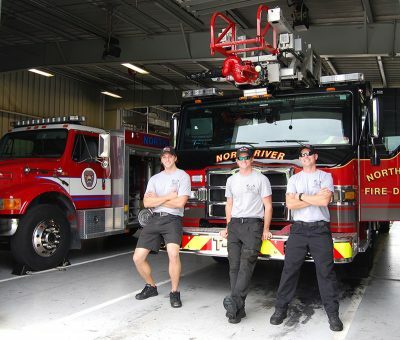 For more information on the North River Fire District, call 941-721-6700 or visit the website at www.nrfd.org. For more information on the Fire Academy at Manatee Technical College go to the website www.manateetech.edu/career-prep/fire-fighter/.